As a hairstylist I build new relationships with clients on a daily basis. Sure I get to know peoples hair really well, but I also get to know about their lives, and often times I find myself touched and inspired from the stories they share with me. This being said, I’d like to introduce you to a very special person in my life, Diem Brown. I first met Diem a few years ago when she came to film at my salon. She is an entertainment reporter and I had been asked to be filmed for a hair segment she was doing. We worked really well together, and she started hiring me any time she had a hair or beauty segment to film. You would never know it by the looks of it, but at age 23 Diem was diagnosed with ovarian cancer. This wasn’t some little tumor either, this thing was big, and if wasn’t detected when it was she probably wouldn’t be here today. She underwent chemotherapy, lost all of her hair, and fought for her life as hard as she could. I’m glad to say that 5 years later she is cancer free, healthy, and happy. People who know Diem know that her hair is part of her identity. I mean, if you had that much gorgeous hair, wouldn’t it be yours too?! When I met her, she hadn’t colored her hair or really done anything to it in years since it was growing back from the chemo. Once I gained her trust and time passed, I became her hairstylist and we slowly started transforming her hair back to what it was pre cancer. I laugh, because people ask her and I all the time if she has hair extensions, not even realizing that just a few years ago she was bald. Diem is the perfect picture of what cancer looks like after you win your battle. Though she is a fantastic reporter, and is currently on MTV’s Battle of The Exes, her #1 passion in life is to build up her foundation, MedGift. Diem is one of the most selfless people I’ve ever met. She is always thinking of others needs and never ever feels sorry for herself or as if she is owed anything. 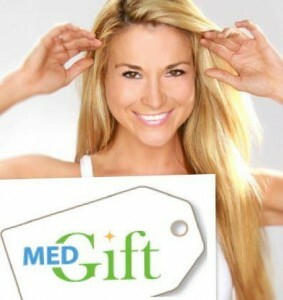 During her fight with cancer, she created MedGift. MedGift is a unique gift registry for hospital patients that allows loved ones to help with their specific Needs, Wants, and Wishes while they are there. Similar to a wedding or baby gift registry, MedGift allows a patient to list the things they need to help them while they are possibly fighting for their own life. If the hospital has MedGift, you can log on to the patients registry and purchase gifts for them. Wigs, wheelchairs, groceries, medical expenses, prayers, the list goes on and on. It’s a way WE can help when we don’t really know how. Genius right? But she needs YOUR help. Unless a hospital knows about MedGift, they won’t be able to offer the registry to their patients. If you know any contacts at hospitals, doctors, nurses, anyone, please tell them about this wonderful website. The goal is to have it in every single hospital so every patient has the ability to use it.